In the end, it was probably appropriate that Lukas Podolski scored from a free-kick. Because it was a game in which Arsenal struggled to create chances through their established way of playing, as Stoke defended deep and forced Arsenal to try and find a different way to score – usually through crosses. And it generally did work, with Alex Oxlade-Chamberlain, Olivier Giroud and to a lesser extent, Laurent Koscielny, spurning good chances from corners. However, the best chance Arsenal did create in the first-half actually came from a quick, flowing move which started with Giroud dropping deep and then spinning away from his marker wwith a deft touch and ended with Oxlade-Chamberlain’s shot tipped wide. If chances few and far were created through an extended passing move, it’s not as if Arsenal played badly. It’s true, that for the most part they were a bit ponderous, with Abou Diaby tending to slow down play. But when he got into the mood, like the rest of his Arsenal team-mates, and played like they can with quick give-and-goes and getting runners beyond quickly, some of Arsenal’s play with a joy to watch. It wasn’t quite as scintillating as their performances in the second-halves against both Liverpool and Chelsea where I can’t overstate enough, just how good it was. Put it this way, it’s been a long time since I’ve seen Arsenal ping the ball one-touch accurately to feet like that. So perhaps it was apt in the end that Lukas Podolski did score because when he and Santi Cazorla both came on, it gave Arsenal something different. Or rather, got them playing the way they normally play. Which is a bit worrying in a sense because it suggests that they’re still very reliant on a core XI of players but make no bones about, this is the way Arsenal must play. They were probably too reliant on wing-play for 60 minutes of the game as Arsene Wenger chose to go with two wingers because he knew Stoke would defend narrow, and as such, their most potent outlet was Theo Walcott on the right. Lukas Podolski, on the other hand, is another striker that Arsenal like to play on the wings but he is different to Walcott in that he’s not so direct. Actually, he fits in imperceptibly to Arsenal’s give-and-go style and his partnership on the left side with Cazorla, Kieran Gibbs and Jack Wilshere looks so potent at the moment. There could be no greater culture shock for Nacho Monreal than Stoke City for his English league debut and fears whether he could mix it with the physical stuff were allayed when he bloodied Jonathan Walters in an unfortunate clash of heads. Actually, it was probably the type of collision a rookie would make but for everything else, Monreal looked very assured. He started the game cautiously but grew more confident in the second-half and played in some telling crosses. At £8m, Monreal is not just a back-up; he’s someone in full ownership of his career and will challenge Gibbs for a starting berth from the off. His passing was neat here, which is what you’d expect from a Spaniard (although his first club, Osasuna, were noted for being the most Stoke-like team in La Liga). It’s tactically, though, which he might be a step up for Wenger as he is positionally sound and is built a bit like a centre-back, giving balance to both sides of defence. How can one explain the difference in performances which can see Arsenal defend as securely as they did here and so jittery in their last few matches? Thomas Vermaelen says they have started recent matches cautiously as they chose to sit and examine opponents’ approaches but as we’ve found out, it’s often proved costly in first-halves. At least it would be easier against Stoke, if that’s even possible to say, because everyone knows how they play. And indeed, Wenger admitted that his side prepared mentally for this test which saw them hardly conceded anything from set-pieces. Of course, Stoke City are a different team away than they are at the Britannia Stadium and often, they were pushed so far back by Arsenal that they couldn’t build out with long passes. 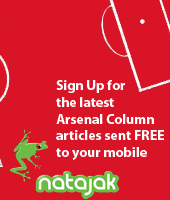 If anything, it hints at Arsenal’s problems being psychological, both from a defensive viewpoint and an attacking one. Because going forward, it demands a certain level of understanding and intuition, and defensively, a lack of confidence often pervades the team and its fans. It’s gotten to the point where nervousness has become self-perpetuating, and The Emirates can be a difficult place to play. However on Saturday, the fans were fully behind their team. From a tactical perspective, Wenger says defensive frailties are a consequence of “our philosophy.” It’s true; attack is a form of Arsenal’s defence, not necessarily in the form of pressing but when the team keeps the ball, it keeps trouble away from their goal. However, it’s when they lose the ball that sometimes Arsenal are not adequately prepared. Often both full-backs push forwards at the same time while Arsenal style anyway, demands resources to be committed to the attack quickly, exposing the backline. Arsenal’s style is inherently risky but not anymore so than Barcelona, who achieve equilibrium by pressing intensely and strategically while suffocating opponents by religiously keeping the ball. Arsenal’s Champions League opponents, Bayern Munich actually play very similar but while he difference can even be amounted to a 3-5% possession variation or better players, they are probably just better at controlling the nuances of attacking play than Arsenal. Indeed, a study in the 1960’s from the labs of Dynamo Kiev says that “a team that makes errors in no more than 15 to 18% of its acts is unbeatable.” You do this by making the pitch as big as possible when you have the ball and as small as possible when you don’t. 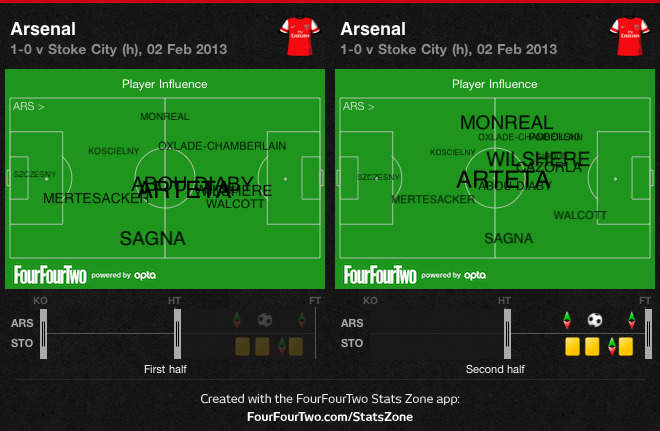 Arsenal achieved the latter against Stoke but need to do it more consistently if they are to be more competitive. Often managers have their favourites and it’s undeniable that Mikel Arteta is Wenger’s. Arteta represents exactly what Wenger wants from his midfielders tactically: someone that can pass the ball and tackle, and from his position, Arteta is his eye on the pitch. His return meant Aaron Ramsey was the one to miss out who some might say unluckily so. But whatever impressions he might have made with his passing, positionally Ramsey is not as advanced as Arteta. That was shown against Liverpool where, despite completing more than 100 passes in successive league games (Arteta made 105 out of 116 against Stoke) he was a bit late in sensing the danger. That could be shown by his positioning when the two goals were scored. For Suarez’s goal, the ball took an unfortunate nick off him as he rushed back to help out when Thomas Vermalen mis-kicked the cross. And when Henderson broke through, his slide tackle was a bit unnecessary as Arsenal had men around the Liverpool midfielder, but felt he had to because of the desperateness of the situation. (His energy, however, brings an interesting dynamic and might even replicate Mathieu Flamini in importance in time). What Ramsey might have going for him ahead of Arteta is his passing range and what I liked about him in that role is that he collects the ball in between the centre-backs, forcing them to spread wide. This makes it harder for opponents to press Arsenal. (When Arteta plays, he tends to push up when Arsenal have it at the back and that puts more onus on the centre-backs, especially Per Mertesacker who the opponents want to have the ball). What Arsenal did well, however, against Stoke with Arteta and Diaby, was that both midfielders alternated dropping deep for possession so whatever plans Stoke had getting tight to them on the ball, was made more difficult. Arteta can also be criticised for being a bit too passive with his passing which is a bit unfair because he made the most final third passes yesterday. Indeed, Arsenal’s style, which is about rebounding quick one-touch passes in the final third like a puck between hockey sticks, gives the impression that it should always be fast and forward moving. What Arteta probably understands is that it’s not always possible and sometimes, moving the ball back and across is equally as effective in creating space. Might Arsenal rue not bringing in another striker in the transfer window? That’s the impression Olivier Giroud gave at times, especially when he incomprehensibly headed across goal from a corner-kick when he should have tried to score. His touch was graceful at times, dropping deep to link up play or acting as the pivot for the midfielders to play around. But he lacks the goal-scoring instinct or the explosive moment that could make something out of nothing for Arsenal. Alas, Podolski’s goal probably postponed such tedious discussions of needing another striker but to avoid it in the future, Giroud might need to add a greedy streak to his game. That’s it. Granted, his direct contribution to the result was winning a free-kick but he was brilliant throughout on the right of the attack, which might actually be his best position. Nevertheless, the key is seemingly to let him play to his ego, let him take free-kicks and corners however wild they might be. Thierry Henry did the same thing at the start. His form has come into question recently but Wenger remains forever grateful to Giles Grimandi for bringing Bacary Sagna to his attentions. He can do everything and as such, at 29 years old, Arsenal would be foolish to not offer Sagna a final, big contract. A downturn in performance is probably just a blip – just ask Patrice Evra what they were saying about him this time last season. But Carl Jenkinson must be pushing Sagna close, especially in these types of matches where opponents sit deep and his crossing can come to the fore. But Sagna brings height and tactical understanding, especially when Walcott is granted the freedom that he has been given recently. As such, Sagna’s lack of form might be a little exaggerated: his role in the side has been adjusted slightly recently. Even so, he’s still a very important player to Arsenal.